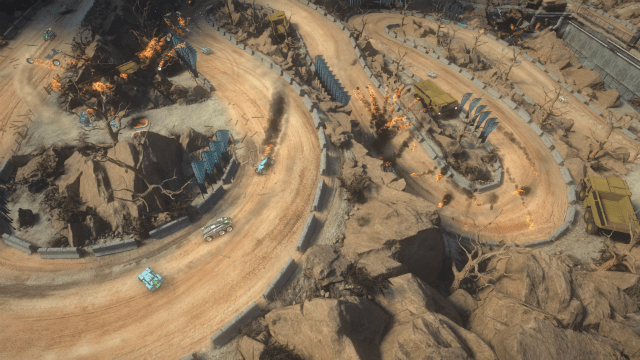 Before Mantis Burn Racing initially released, I had the pleasure of speaking to the developers at VooFoo Studios about what we should come to expect. After spending just five minutes with the game, one of my very first questions centred on where the weapons for the cars were. You see, in my eyes, one of the core parts of any decent top down racer is in the weapons and power-ups it brings. And the cars in Mantis Burn Racing had none. Except for a bit of a speed boost every now and then. 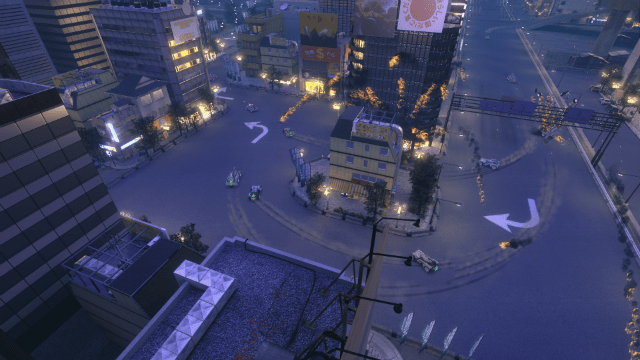 VooFoo explained that they had a huge amount of faith in their game, the physics it contained and the visuals which held it all together to believe that there wasn’t a need to initially run down the whole destruction route. They didn’t however rule out that weapons wouldn’t appear further down the line though. And now, one year on from when the game first arrived, they have been true to their word as the chaos can commence with the introduction of the Mantis Burn Racing Battle Cars DLC. The Battle Cars DLC does pretty much what you would expect it to do – it adds guns to the top and mines to the rear of three new vehicles. Now obviously these aren’t your bog standard racing vehicles, these are cars that come with a ton of armour attached in order to be able to allow them to even stand a chance of making it to the end of a race. But thankfully, no matter whether you use the new Mauler as the heavy truck, the mid-range Lancer or the nippy lightweight Stinger speedster, they all still utilise the brilliant physics which the Mantis Burn vehicles have become known for. Placed alongside multiple vehicles from the same ilk, the racing is just as frantic as before, but now, as soon as the first checkpoint is hit, all hell breaks loose. This is when the forward facing machine gun is activated for each and every racer, ensuring that anyone within hitting distance of a car behind them needs to be pretty damn worried. The gun itself is fast firing, but can overheat quickly, so anyone found going crazy with it will end up unable to fire for a short period of time, leaving them open to all manner of attack by fellow racers. To counter the destructive nature of the gun, each racer also has access to three high explosive mines. These don’t come into play until you cross the start finish line for the first time, but once they do, it gives any car that is under threat from a gun-toting opponent a bit of security. Dropping in behind the car, if any other racer were then to run over your mine, they would be destroyed instantly, leaving them to spawn back into play a few precious seconds later. With the three mines being reallocated to each combatant on every new lap, it won’t take long for you to realise exactly how manic things in each event can get. And with the introduction of the Battle Cars DLC, we see Mantis Burn Racing players get access to all new event types. A deep career season has been thrown in specifically for these battlers to excel, and that means the new ‘King of the Track’, ‘Survival’ and ‘Accumulator Rumble’ events will be something that you’ll find yourself spending many a minute with. Each do pretty much what their name suggests, but on the whole, the longer you can survive and the more you can destroy, the more points you’ll find yourself earning and the better your XP bonuses will become. With the usual single and multi-race events still in place, the new events work well with the change in focus that the Battle Cars bring – delivering something a little different to what we had come to love in the previous career seasons. With a whole new career tree holding the joys of the Battle Cars DLC, and the usual Mantis Burn Gears, XP and multiplayer system powering things along, if you ever thought the game was missing something initially, then now you should be pretty well covered. Except that the addition of the two weapons hasn’t quite gone far enough. You see, once that first checkpoint throws the guns into play, should a lone wolf magically sprint away from the ensuing chaos then that is pretty much the race over – within a few short corners. With the others destroying each other, before respawning and destroying each other some more, anyone lucky enough to get a clean getaway at the start will rarely be caught. Yes, the odd mine may be able to stop them, but seeing as those explode after a short time, should no-one hit it, then the chances of a leader coming round in the next lap and clattering into it are small at best. Instead, a larger variety of weapons, preferably including something along the lines of a homing missile to occasionally rein in the leaders, would probably be the best solution. It would keep the racing tight, and give everyone something to race for, but then, in the same breath, Mantis Burn Racing ain’t Mario Kart… and never should it be. That said though I’m more than pleased that VooFoo have implemented a new system, especially one that comes with such a cheap price point and breathes fresh life into a brilliant racer. Personally, I’d have been happy if they had gone the whole hog and thrown in a superbly varied weapons system, but completely understand why they have instead decided that the physics behind Mantis Burn are still key to its success. And that’s because those physics are key, and they should never be ignored. 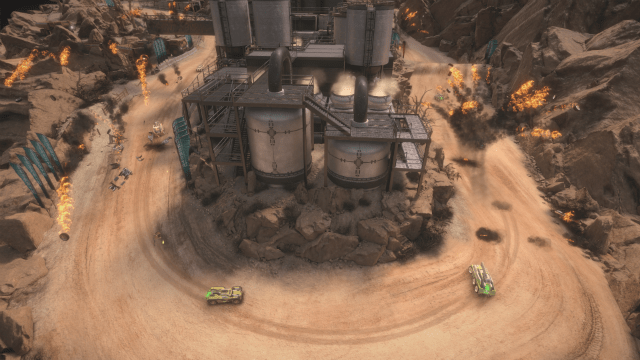 If you had previously picked up Mantis Burn Racing and enjoyed the deep career and brilliant multiplayer offerings that it delivered, then you really should head back in for a bit of fun and games with guns and mines. If however you kept away initially, preferring your racers to deliver fun and craziness instead of smooth racing, then you may still be left disappointed. The price point really does make the whole Battle Cars thing more than worth a little shot though. Previous articleFeel the full force of the latest Mantis Burn Racing DLC as Battle Cars arrive!